Other GSU-502-208-CT Similar Urn Heater Immersion Heater The GSU-502-208-CT similar urn heater is made for applications requiring 208 volt power single phase and 5000 watts. 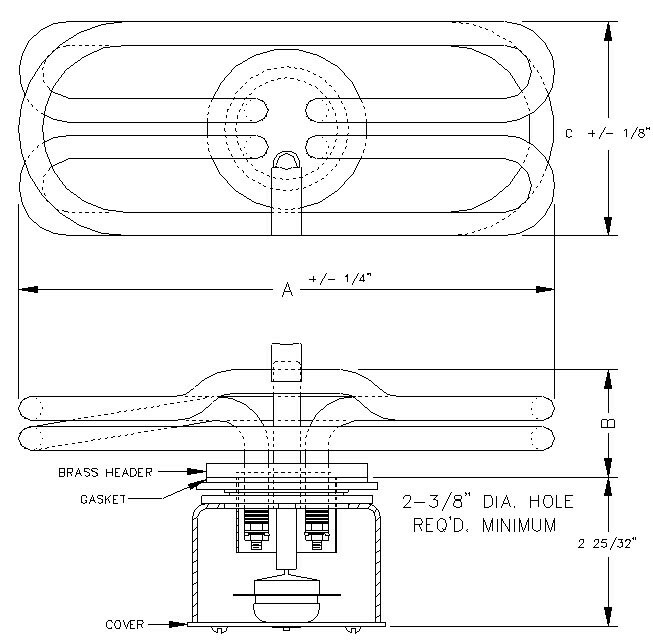 In the urn heater diagram that is shown below, the "A" overall heater length dimension is 11 inches, the "B" inside tank height is 2.25 inch, and the "C" width dimension is 4 inches. The GSU-502-208-CT urn heater has been obsoleted. The replacement heater (UH1-50-208-CO) is an immersion heater built with a lower watt density to provide a long heater life and dependable performance. Urn heaters can be designed for use in commercial coffee makers, percolators, restaurant buffet tables, sterilizers, autoclaves, steam tables, kettles, and humidifiers. These immersion heaters are ideal for other applications that require a low profile and short tubular element lengths. The UH1-50-208-CO urn heater is made for applications requiring 208 volt power single phase and 5000 watts. In the urn heater diagram that is shown below, the "A" overall heater length dimension is 11 inches, the "B" inside tank height is 2.25 inch, and the "C" width dimension is 4 inches. This heater comes with two copper sheath tubular elements that are silver brazed into a brass header. This heater is also supplied with a standard 4 inch SQUARE conduit box. The Glenn Electric immersion heater part number is GSU-502-208-CO, 10-6383-19 or element number 10-6385-11. An optional thermal cut-off is supplied with this immersion heater. This protective mechanism will shut the power off to the heater whenever a low liquid level is detected.